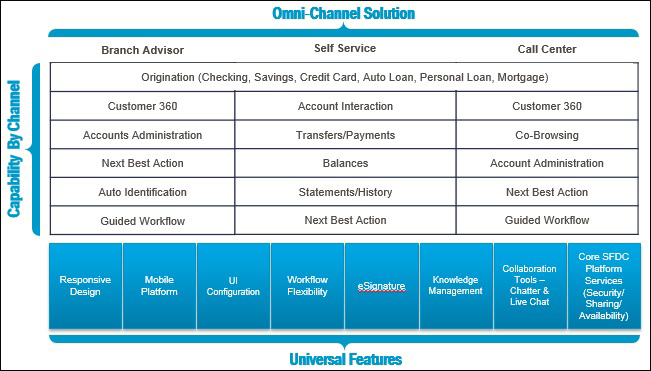 The Capgemini All Channel Experience (ACE) for Banking solution provides a configurable, end-to-end, omni-channel solution that unites all customer platforms and front-end customer engagement systems. It leverages the Salesforce Financial Services Cloud in support of common operations, processes, and channels found in retail banks. Bankers want to create positive customer journeys and experiences that will delight customers and create a true 360-degree view of customer data, and activities that empowers their staff. Perhaps more than any other business, however, banks face challenges: siloed lines of business, stand-alone systems and stand-alone functional areas. Banks that overcome these challenges and connect traditional channels, digital channels, and stores in a seamless way—employing a single flexible system of customer engagement—gain a significant competitive advantage. complete integration to core banking systems; external applications and services. These capabilities offer clients accelerated time-to-market and ROI of, on average, 45% after 15 months. Winner of Salesforce’s 2015 Partner Innovation Award in Financial Services and ranked as a Leader in an independent report on Salesforce Implementation Partners 2015 by Forrester Research, Inc., Capgemini is a Global Strategic Cloud Alliance partner with Salesforce. We have over 1300 Salesforce practitioners worldwide, and our proven methodologies and intensive knowledge of Salesforce technologies delivers predictable and economically balanced services. Our proven transformation model, combined with our end-to-end technology solution, brings rapid and cost-effective enablement to banks.